🎉 GET 10% OFF! - Use Promo Code: PARTY10 on any order of $75 or more! 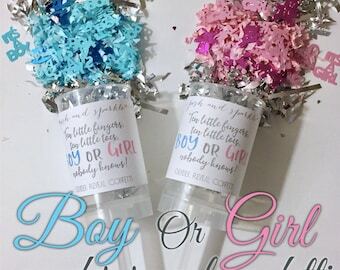 This biodegradable version of our “He or She, What Will This Little Hunny Bee?” Gender Reveal Confetti Poppers means you can launch them outside if you wish! 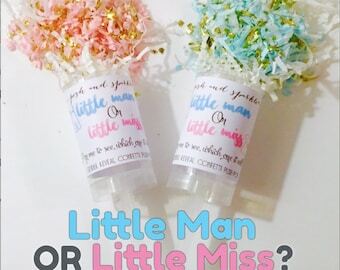 They are a really enjoyable and exciting way for everyone at your party to participate in revealing baby’s gender. 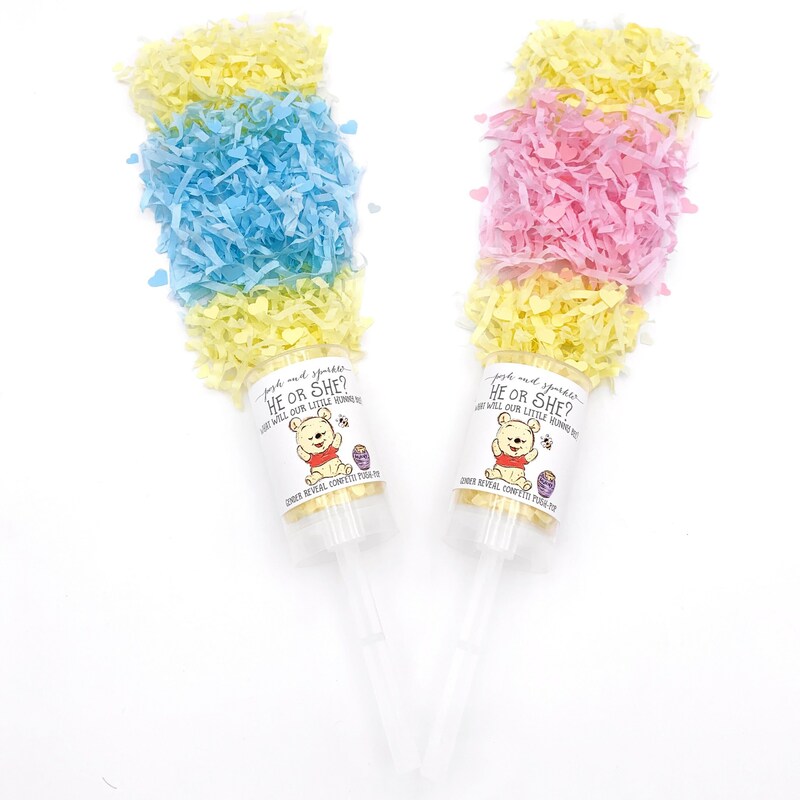 Hand one out to your guests, take off the lid, count down from 5, push the stick up with the palm of your hand and yell “Our hunny bee is a.…” for a harmless explosion of either blue or pink confetti! 🎉This listing is for one (1) push-pop. 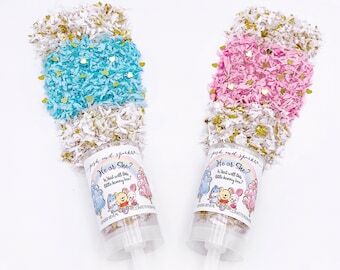 🎉Each end is filled with pale yellow confetti shred with matching hearts and hidden inside is either: FOR A GIRL: light pink confetti streams and matching paper confetti hearts; FOR A BOY: light blue confetti streams and matching paper confetti hearts. 🎉The push-pop's label covers the gender-themed colored confetti so that the gender is not visible until the push-pop has been popped! 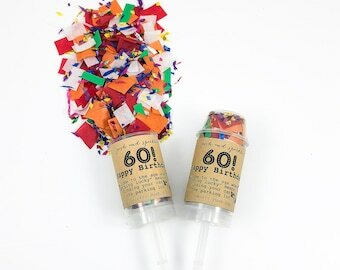 🎉RE-USEABLE, FOOD SAFE plastic containers so you can fill them up again for your next event with our convenient re-fill confetti bags and even re-use them for fun party foods such as dessert parfaits! 🎉BIODEGRADABLE confetti as it is entirely made from biodegradable paper and tissue. 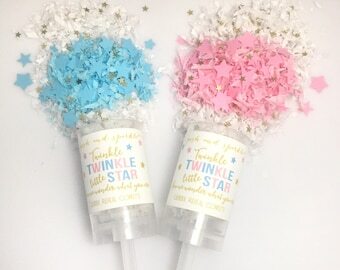 For custom theme/color confetti, please contact us using the “Request a Custom Order” link above and we’ll be happy to make the perfect push-pop for your event! Orders of 1-20 push pops takes 1-3 business days. Orders of 30-50 takes 3-5 business days. Orders of 50+ takes 5-7 business days (or more depending on size of order). If you need a rush order, please contact us PRIOR to purchasing so we may confirm availability and any additional charges. We 💗 to see and share our amazing customers enjoying our confetti! 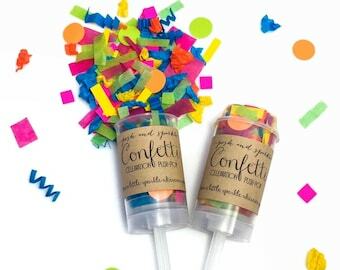 If you have any questions regarding this confetti push-pop, please use the “Ask a Question” button next to the price and we’ll get right back to you! The custom label was exactly what I envisioned and I couldn’t be happier! The seller was wonderful to do business with and so very helpful. I would give her more than five stars if I could. The item arrived very quickly. I look forward to doing business with her again.